Christmas eve we went to steve and barbara's house for soup and dessert. everything was delicious. then we just had fun hanging out and telling stories. when we got home the kids opened their traditional present of pj's from mom and dad. even will who usually hates putting on pj's wanted to put his on. he instantly started to take his clothes off. will was trying to show us that he had stars on the bottom of his feet. my sister marcy sent me a cd with a few christmas pictures of me when i was little. it was so fun to see them since i don't have any pictures of me when i was little. i thought i would share two of my favorites. thanks marcy, and thanks for the letter. 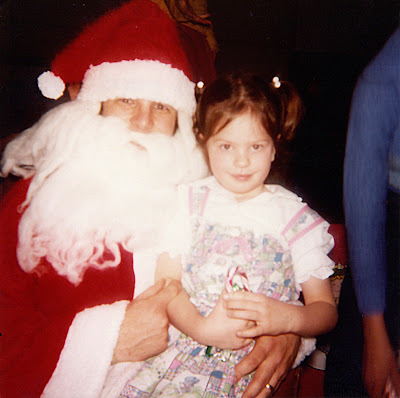 btw, santa in this picture just happens to be my dad. i guess this is where my kids get it from. 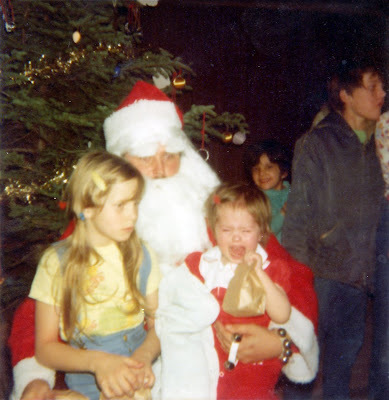 they aren't real fond of sitting on santa's lap either. here is will "helping" put up ornaments. it was bubba's turn to do the star this year. kaylee hanging her favorite snowman ornament from grandma peanut. (look at kaylee and jeff's profile's don't they look so much alike? just wanted to show off her cute hair. i got this idea from hair4myprincess.blogspot.com. cute huh? will's favorite part of the party: COOKIES! (he may or may not have had like 3 big cookies) he didn't stay on too long, (about 1 second) but at least he didn't cry, which is what my other two did at this age. bubba wants a remote control dinosaur?? what?! has anyone seen a cheap one? kaylee wants an american girl doll julie. or any american girl doll stuff. friday night we had game night and desserts at our house with the smiths,the greg nygren family and the foutz's. we had so much fun. this is the only picture we got from that night. bummer. i have really been slacking in the picture taking. i wish i had gotten more of all the cousins together. will (batman) riding on his bike. he was hilarious. he was actually riding it. walking around and making it move. we had 13 kids and 12 adults. it was loud, messy and so much fun. thanks to all who came and brought goodies. here we are, waiting for the polar express to arive. obviously will was being his typrical rotten 2 year old self. sheesh, i can't wait for him to be 3! finally! it arrives! the kids were so excited. by now, even will was getting excited and was cooperating (almost). kaylee and her cousin kylie. they had a blast together this weekend. we finally made it to the north pole, and who do you think was there waiting for us? that's right, santa! and he gave each of the kids bells, just like the book. will, still cooperating, can you believe it? andrew and kaylee with thier bells.